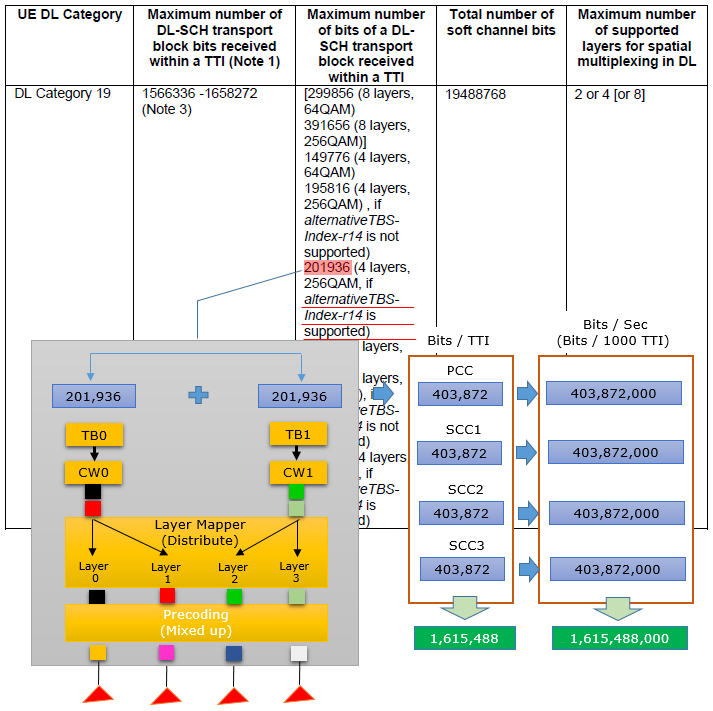 For many people working in LTE, one of the most important question would be what is the maximum throughput for a network, device or network operator. The throughput for a device working in a live network would vary at every moment as you can see this drive test. 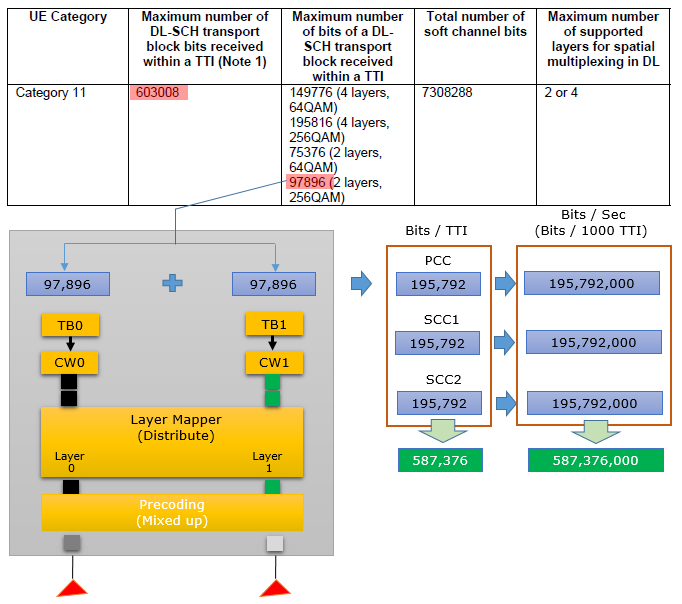 If you knows of the MCS, Number of RBs scheduled by eNB (Network), you can calculate the throughput as in FDD Throughput Calculation and TDD Throughput Calculation page. 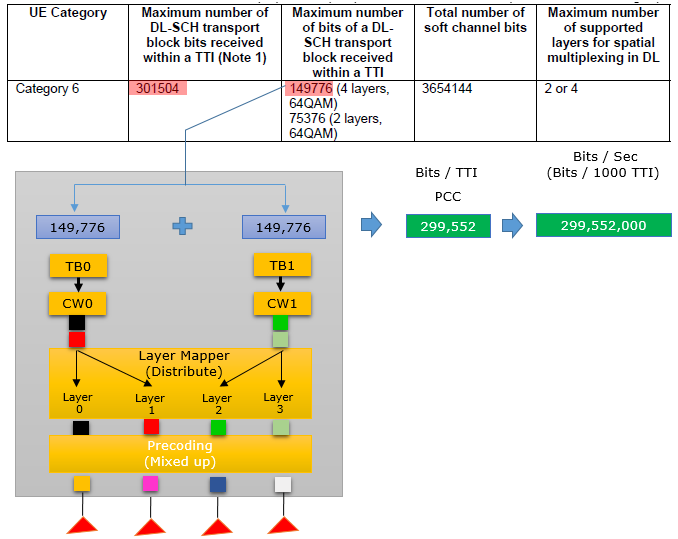 However, if you ask what is the maximum achievavle throughput for a network or device if we assume that all the resources are allocated to a single UE(device) and signal quality is at the best condition, there is a relatively easy way to estimate it. 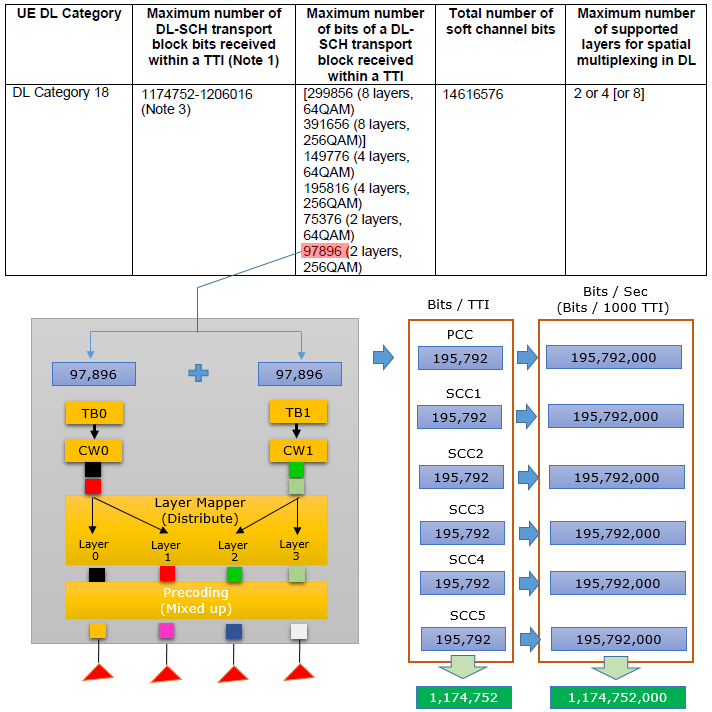 You can estimate the ideal throughput from UE Category specification. However, it would not be so intuitive to get the throughput information from the table if you don't know the meaning of the numbers in the table. Even if you know the meaning, it would be cumbersome to do calculations everytime you look into the table and this calculation gets more annoying as UE Category gets higher since there are more possible combinations to achieve the desired throught and the calculation gets a little bit different depending on each of the combinations. In this page, I will try to explan the meaning of some numbers which is directly related to throughput calculation and put down some examples that are commonly used so that you don't have to keep abusing your brain every time you look into the table. 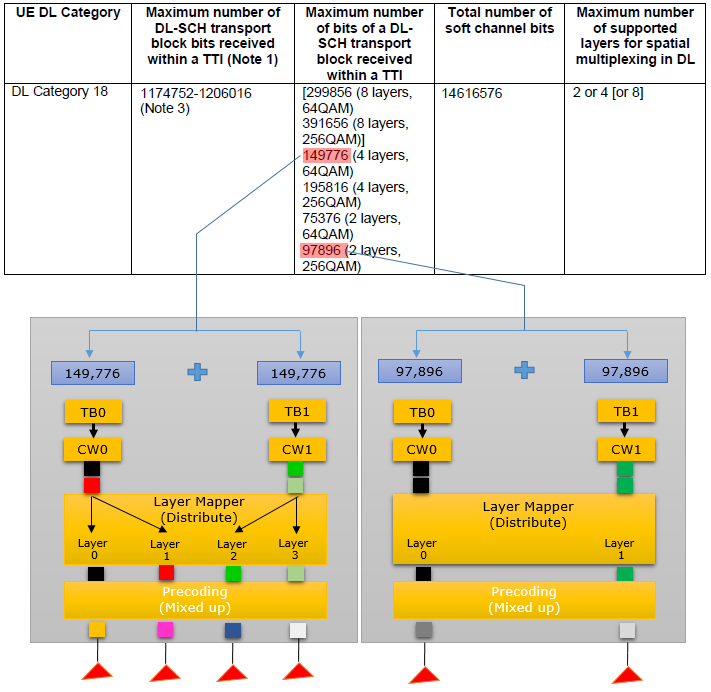 The parameters that are directly involved in the max throughput estimation are highlighted as below. 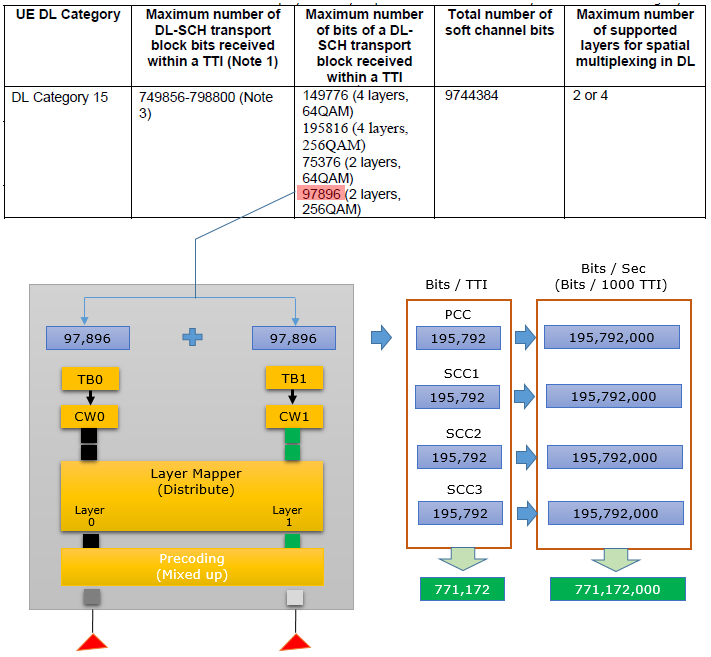 The meaning and how they are related to the throughput estimation is as follows. Is there any relationship between (A) and (B). How (B) is related to (A) if any ? The answer is Yes, these two numbers are closely related. 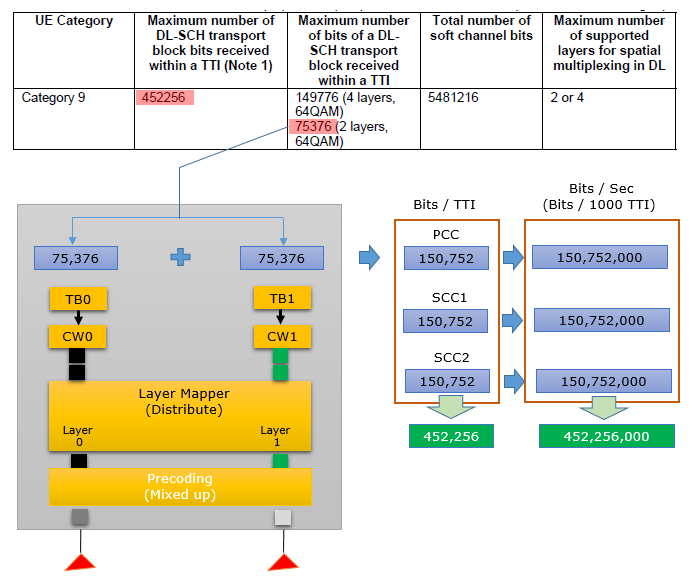 If the transport block size is same for all the component carriers(CC) which comprises the system, The relation can be described as follows. What does N mean ? It is the total number of layers in the system. For example, if a system of made up of 2 CC and each CC is 2x2 MIMO(64QAM) in the table above. N becomes 4. And (A) and (B) are related as follows. where B_CC1 is (B) for CC1, N_CC1 is number of layers for CC1 and so on. Now we will look into many example for a several selected UE Categories. These are only some of the examples, not the exhaustive combinations. I think these examples would show you most of the combinations that you might have seen in the field. NOTE : Each of the examples, you will see a digram illustrating a overal data flow structure of a eNB. However, the diagram shows only a type of eNB used in the combination, it does not show all of the eNBs in the system. There is a room barely enough for only one or two eNBs in the page. That's why I couldn't draw all the eNBs in the system. 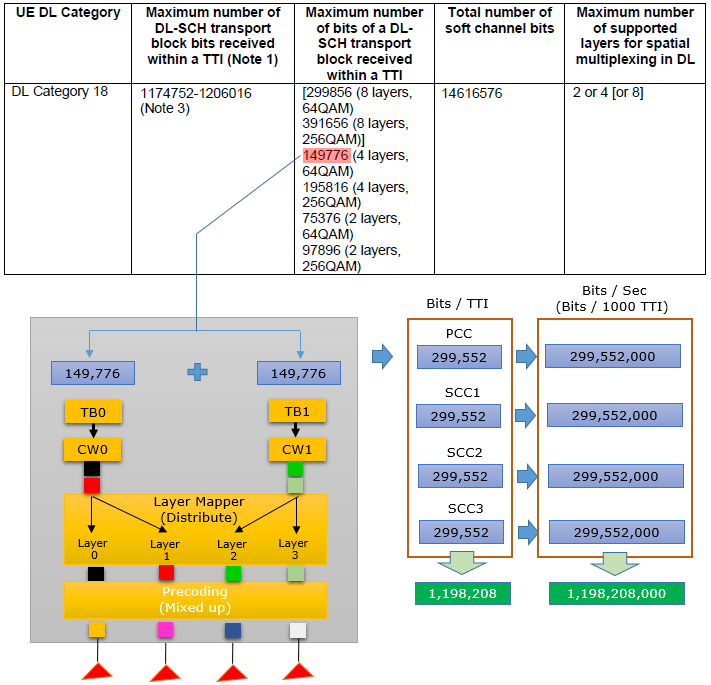 For example, if you see only one eNB diagram and the system is made up of 3 CC. It means the system is using the 3CCs with the same eNB structure (i.e same antenna configuration). 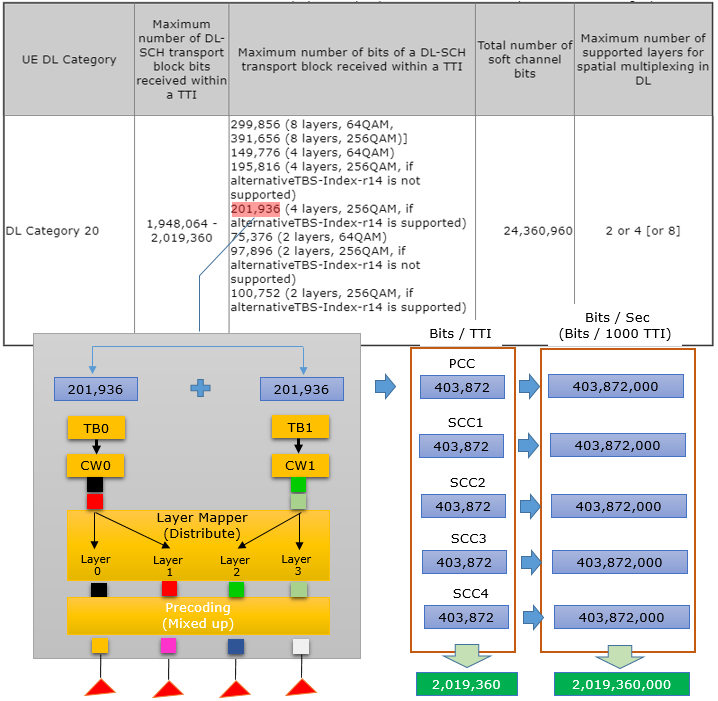 If you see two eNB diagram for the 3CC CA system, it means the system is made up of combining those two types of eNB(e.g, two 2x2 eNB + one 4x4 eNB). 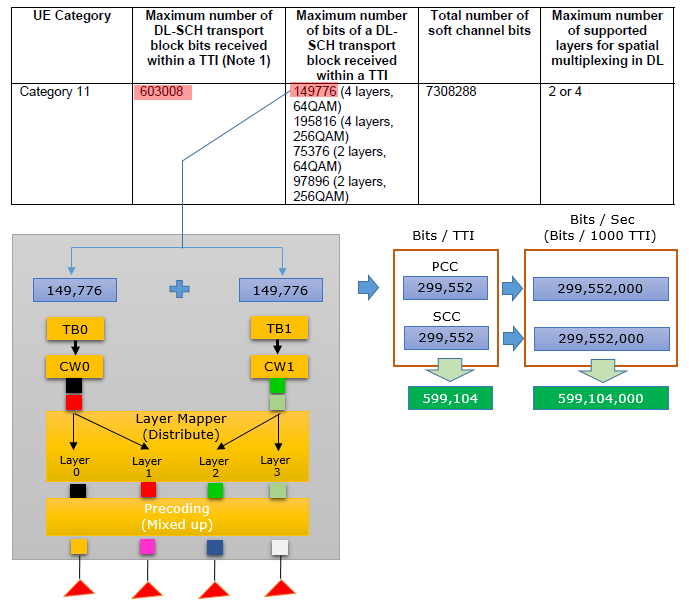 Maximum Throughput for Category 6 is 301,504,000 bits (around 300 Mbps) and this can be implemented in a couple of different ways as shown in the follows examples. In this example, Catetory 6 is implemented by 2CC Carrier aggregation as illustrated below. The two CC (Component Carrier) uses the same antenna configuration as illustrated below. 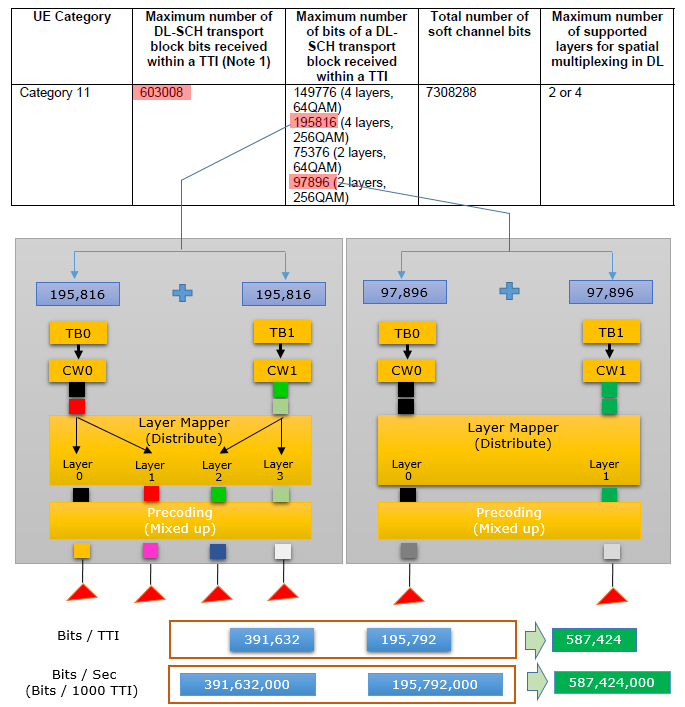 In this example, the category 6 throughput is achieved by single carrier that uses 4 x 4 MIMO as illustrated below. Maximum Throughput for Category 9 is 452,256,000 bits (around 450 Mbps) and this can be implemented in a couple of different ways as shown in the follows examples. 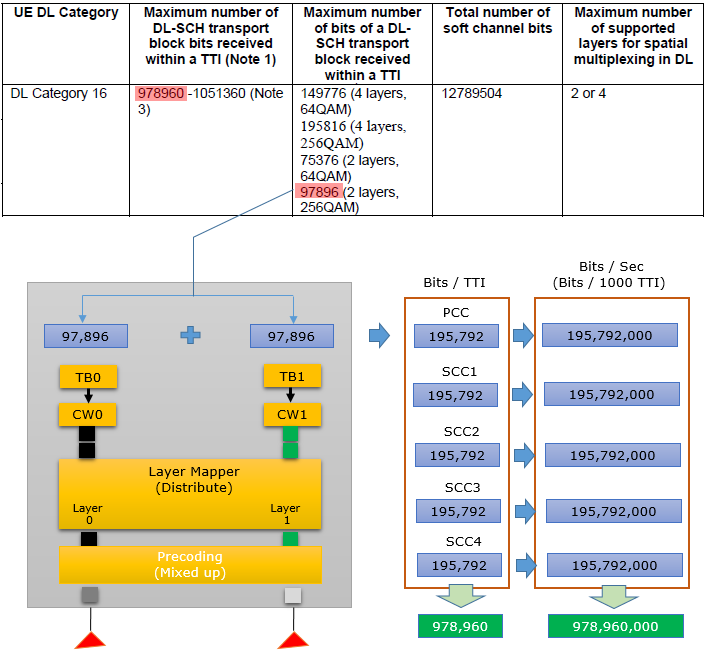 Maximum Throughput for Category 11 is 603,008,000 bits (around 600 Mbps) and this can be implemented in many different ways. Some examples of the possible configuration are shown in the follows examples. 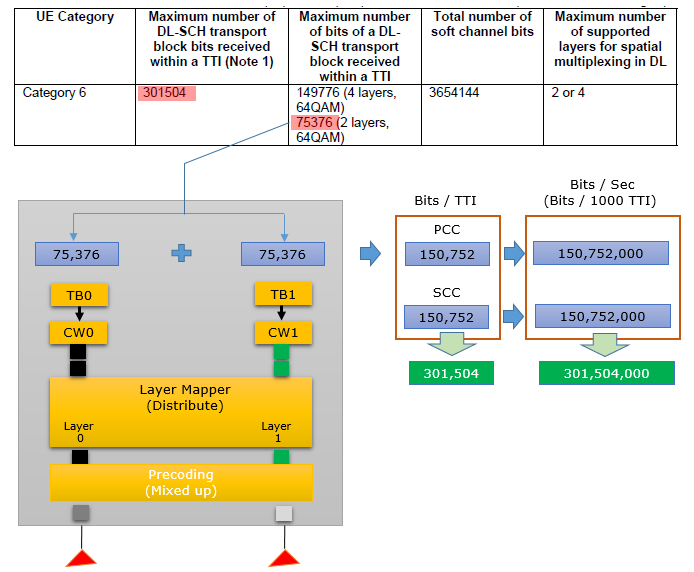 Maximum Throughput for Category 12 is 603,008,000 bits (around 600 Mbps) and this can be implemented in many different ways. Some examples of the possible configuration are shown in the follows examples. 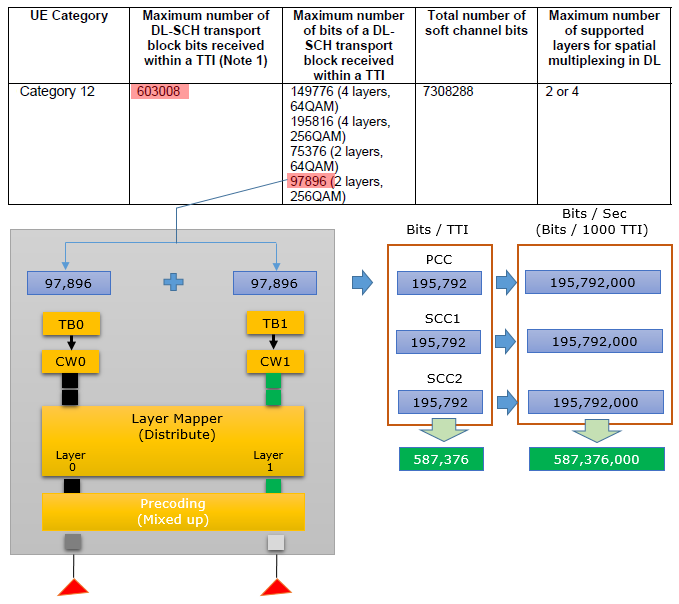 Basically the throughput and transport block size at this layer for Category 12 is same as Category 11. 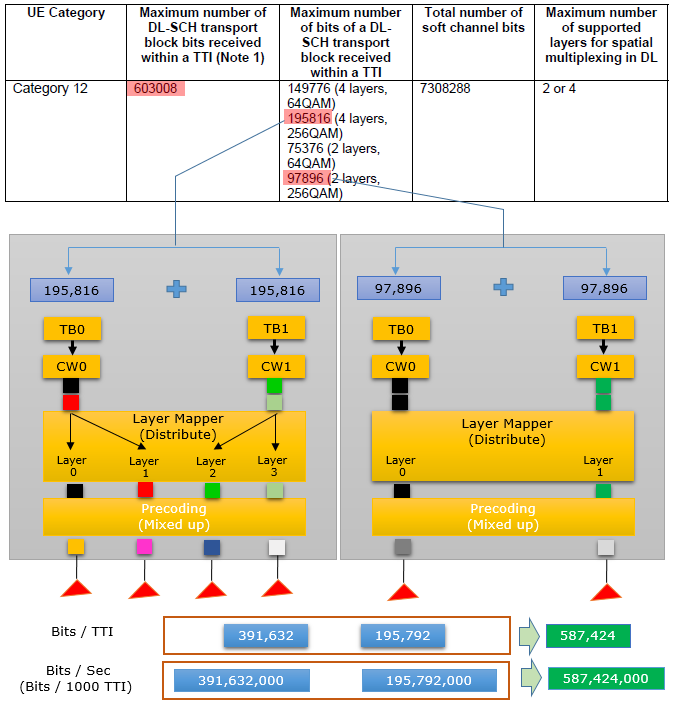 The differences between Category 11 and 12 for Downlink lies in the layer higher than PHY/MAC and Uplink PHY/MAC throughput(See 36.306-Table 4.1-2 for Uplink Throughput). 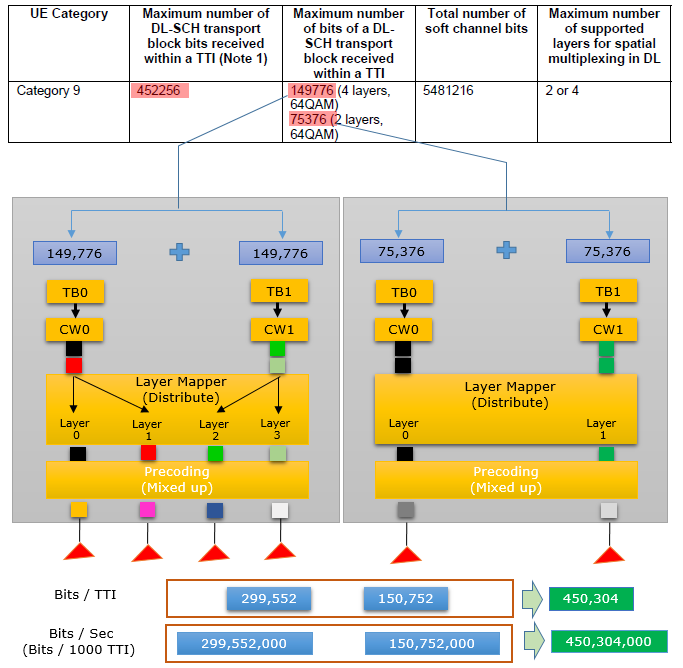 Maximum Throughput for Category 15 ranges from 749,856,000 to 798,800,000 bits (around 800 Mbps) and this can be implemented in many different ways. Some examples of the possible configuration are shown in the follows examples. 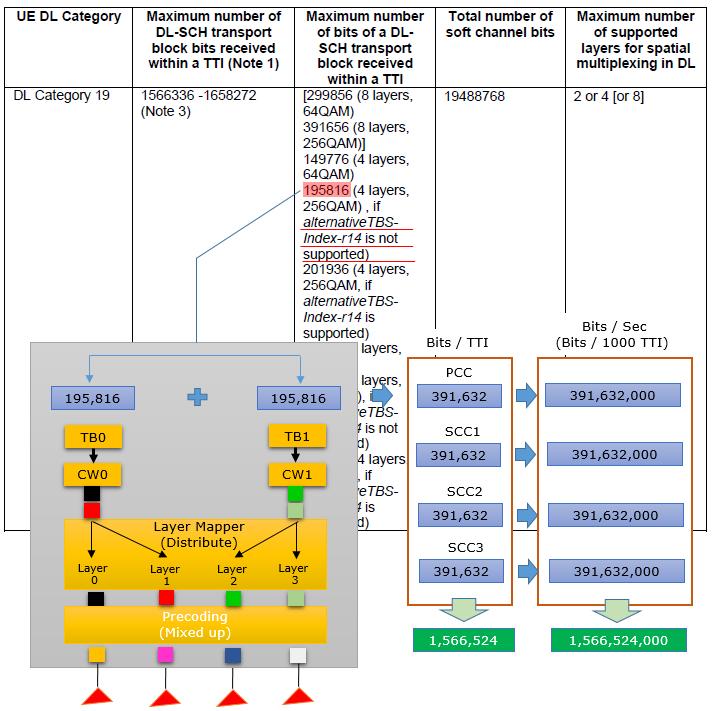 Maximum Throughput for Category 16 ranges from 978,960,000 (around 980 Mbps) to 1,051,360,000 bits (around 1 Gbps) and this can be implemented in many different ways. Some examples of the possible configuration are shown in the follows examples. Maximum Throughput for Category 18 ranges from 1,174,752,000 to 1,206,016,000 bits (around 1.2 Gbps) and this can be implemented in many different ways. Some examples of the possible configuration are shown in the follows examples. 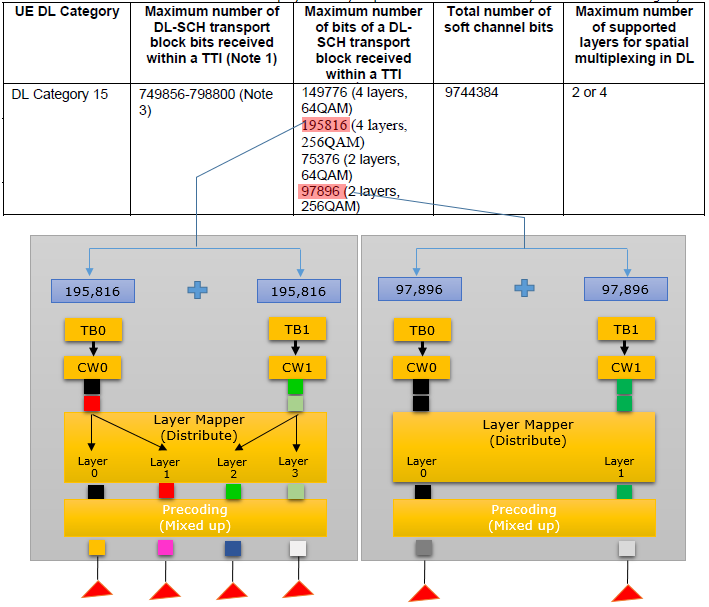 Maximum Throughput for Category 19 ranges from 1,566,336,000 (around 1.55 Gbps) to 1,658,272,000 bits (around 1.65 Gbps) and this can be implemented in many different ways. Some examples of the possible configuration are shown in the follows examples. 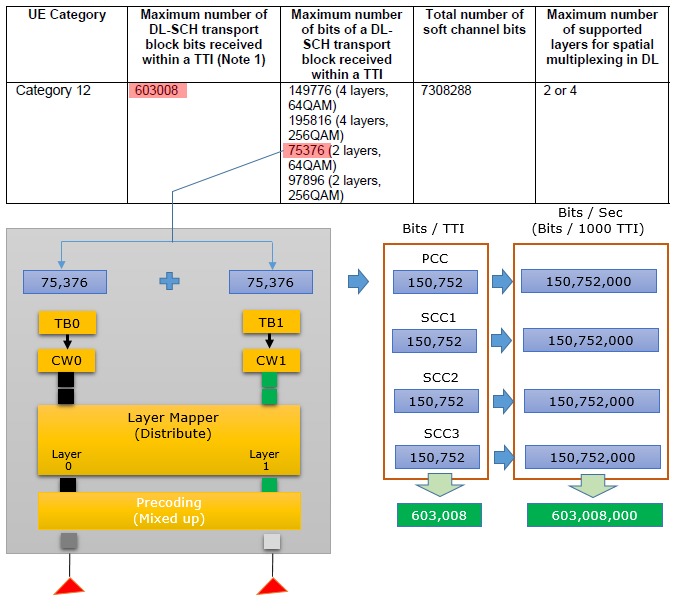 Maximum Throughput for Category 20 ranges from 1,948,064,000 (just a little below 2 Gbps) to 2,019,360,000 bits (around 2 Gbps) and this can be implemented in many different ways. Some examples of the possible configuration are shown in the follows examples.